Check out Tobi's Madeline Plunging Blouse Up your game with the Wine Madeline Plunging Blouse. This long sleeve blouse has a deep v neck and a front knot detail, and is cinched at the back waist for a more fitted silhouette. Super handy to have in your formal corner, you'll want to break this twist blouse out with denim too. Up your game with the Black Madeline Plunging Blouse. This long sleeve blouse has a deep v neck and a front knot detail, and is cinched at the back waist for a more fitted silhouette. Super handy to have in your formal corner, you'll want to break this twist blouse out with denim too. 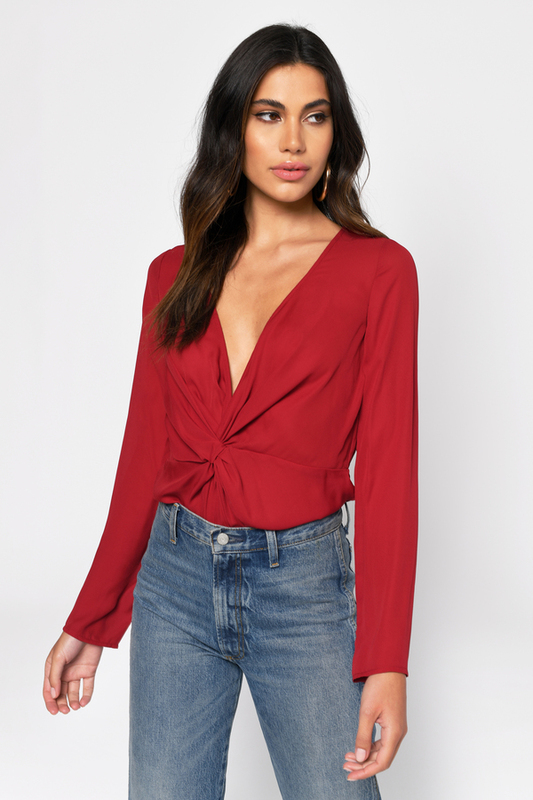 Up your game with the Wine Madeline Plunging Blouse. This long sleeve blouse has a deep v neck and a front knot detail, and is cinched at the back waist for a more fitted silhouette. Super handy to have in your formal corner, you'll want to break this twist blouse out with denim too.